Blowout Sale! Save 56% on the Pink Butcher Kraft Paper Roll - 24'' x 175 ' (2100'') Peach Wrapping Paper for Beef Briskets - USA Made - All Natural FDA Approved Food Grade BBQ Meat Smoking Paper - Unbleached Unwaxed Uncoated Sheet by tenderlicious at In The National Interest. MPN: 24. Hurry! Limited time offer. Offer valid only while supplies last. Pink Butcher Paper also known as peach paper or the BBQ paper. It is highly popular among BBQ professionals for wrapping briskets/meat for smoking. Pink Butcher Paper also known as peach paper or the BBQ paper. It is highly popular among BBQ professionals for wrapping briskets/meat for smoking. This is because foil is non-porous and it does not allow the steam to escape during smoking. It will condense and in turn, soil the crispy bark of the meat. A highly porous butcher paper solves most of these issues by allowing the steam to escape, while keeping the contents protected from the full assault of the smoker. Our paper, made in USA, has been around since 1982. Using our specially formulated treatment, the internal paper structure has been strengthen, such that it will not fall apart easily when it is soaked with oil or water. This wet strength property makes it perfect for wrapping food/meat with high oil or fat content. It is also unbleached and FDA approved as safe for direct food contact. Although you can technically use any kind of kraft paper for food, you have no idea what are the chemicals used in the manufacturing, which may be harmful to your body. For BBQ enthusiasts out there, being food grade is still not enough and doesn't mean it's fine to use in the smoker. Freezer paper, for example, has a layer of polyethylene plastic that will melt at 180f. Thus, it's important for the paper to be uncoated and unwaxed as well. Tenderlicious Butcher Paper has a density of 40#, making it extra strong for smoking, cooking, storing and wrapping freshly cut meats. With the peach tint, the paper has unique rustic feel, making it popular for food serving, enhances the appearance of sandwiches, burger, fresh meats, poultry and fish. 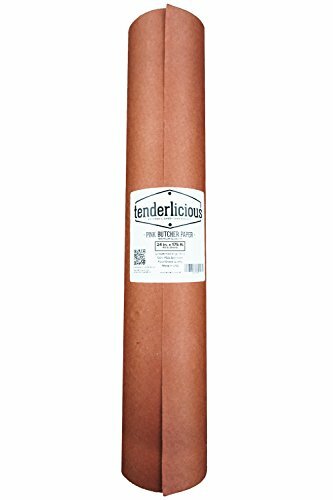 Tenderlicious 175feet Butcher paper comes in 24inches (width) by 3.6inches (diameter). Add to cart now and own the paper in matter of days ! ✮ 100% MADE IN USA: Tenderlicous Butcher Paper is manufactured right here in America, in accordance to the highest FDA standards. It's definitely a safe and healty choice for you and your family. ✮ FINEST QUALITY: It is unbleached and all natural. There is no wax and polymer coating on the paper. We only choose the finest pure virgin pulps to make our paper. ✮ AUTHENTIC TEXAS STYLE: Our paper is chosen by many BBQ enthusiasts to create the Texas style brisket smoking. The paper protects the meat from the full assault of the smoker, while its high breathability property also allows the steam to escape the wrapping. Thus this will not create soggy exterior bark. ✮ STRONG AND DURABLE: Our specially formulated treament on the internal paper structure gives the extra boost to the paper's wet strength so that it will not fall apart that easily when it gets soaked in oil or water. ✮ MULTI-PURPOSE FOOD SERVING: Beautiful natural peach tint has made it an excellent aesthetic choice for serving other types of food such as sandwiches, burgers, fries and etc. If you have any questions about this product by tenderlicious, contact us by completing and submitting the form below. If you are looking for a specif part number, please include it with your message.